The Dragon is the synthesis of all animals birds, reptiles, and all manner of beasts join together to create the mythical creature the dragon. Symbolically the Dragon is the king of the mythological realm and is noted in every cultures history. Dragon Yoga is the fusion of all systems of body – mind – spirit based arts. Chi Kung, Tai Chi, Kung Fu, and Yoga all combine to form a style of Unity. Yoga has been defined as union. Dragon Yoga offers a strong foundation in the ancient teachings of Yoga broght to light in the Vedas and primarally in the Hatha Yoga Pradipika teachings of Patanjalii. These practices are moral and spiritual as well as physical and mental. Our lives and the world around us becomes our practice and our teacher. The Shaolin path of chop wood carry water meets with the Yogic road of single pointed dharanic focus to yeild the ultimate jewel of true discernment. 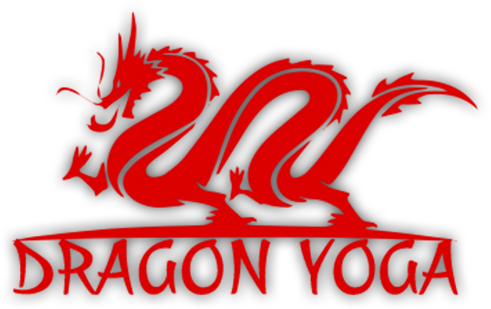 Dragon Yogas basic teachings are expressed in the contents of the Concept section of this site. The Dragon Yoga basic practices are varied as are its foundations. Some of the classic Dragon Yoga practices are the Five Elemental Dragons. The Element of Fire is Active, Powerful, and Dynamic. This pose is know as Warrior Pose or Virabhadrasana in yoga and is called bow stance in martial arts. This is one of the most potently rooted ways of standing. Many great tai chi masters would hold off 10 men pushing on them in this pose. The back leg is straight as is the arm on the same side. The front leg is bent at the knee and is sunken deeply. The front foot faces forward and the back foot is at a 45º angle. The back is kept straight. Many had variations are available from the traditional hands in prayer to more advanced practices. The Element of Wood is strong and rooted. Wood drills itself into the earth and draws up nutrients(metal) carried by water to feed itself and grow big and powerful. The Tree is the ultimate symbol of wood while a stick is a basic one. The wooden dragon posture is a variation of Virkshasana or Tree pose and Tadasana Mountain pose. Both of these postures are designed to ground and help develop greater balance. To practice begin by standing with feet together ankles touching. Stand as straight and tall as possible and extend arms out to the side parallel to the ground. Press palms outward drawing fingertips toward head and pressing out from heel of palm. Extend energy down into the earth and push up towards the sky with the top of your head. For variations on this posture: place one leg in half lotus or place the sole of one foot on the inner thigh of the opposite leg. For advanced practices see balancing bowls. The Earth Dragon is grounded and firm. This stance is known in martial arts as Horse Stance. This low and wide stance provides plenty of power while still offering a maximum of balance and mobility. The Earth dragon is designed to help root and sink energy into the earth creating a sturdy foundation and a potent connection. This practice has varying degrees of intensity. Beginners can start by measuring hip distance or the distance from your foot to your knee. Take a stance that wide and bend the knees gently while still keeping the back straight. For more advanced practice take a stance one god pace away so that you can sink all the way down so your thighs are parallel to the floor. Always your toes point forward. A good test to see if your legs are parallel to the floor is to take a staff or broom and lay it across if you are too high it will roll off. Remember to keep your back straight. Hold your locks deeply in this as in all poses. The Water Dragon is a curving fluid stance. Like water moving around rocks or steam rising into the heavens the water dragon percolates energy up from the earth into the upper dan tien. This pose is known in yoga as Utkatasana. This posture is practiced by placing the feet and ankles together and sinking into the ankles (bent), the knees (bent), the hips (bent), the back arched (bent), the neck (bent), the elbows (bent) and the wrists (bent) these are the seven curves of the water dragon. This pose is meant to sunk into as deeply as possible with the focus on the inner palms. Metal is cold and hard, cutting and sharp, the metal dragon is a pose with a strongly directed focus. The metal dragon is a deep stance and is rooted in the center with 70% of the weight on the rear (bent) leg and 30% on the front (straight) leg. The back foot points out at a 45º angle and the front foot is at a 110º angle both from the hips. The top arm comes over the head with its fist facing forward while the bottom arm is bent with the elbow by the kidney and the fist faces upwards.This pose is also known as sinking leg stance or recoiled tiger stance in kung fu and is a variation of Parsvakonasana in yoga.